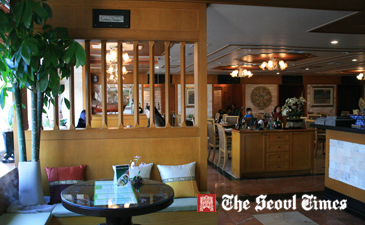 "Thai Garden" in Itaewon is "a home away from home" for all Thai expats living in Seoul. Located by the Itaewon Hotel "Thai Garden" is highly special in the quality and quantity of the food and also in its interior design thanks to passion of its owner, Mr. Doo-Shick (Philip) Park. 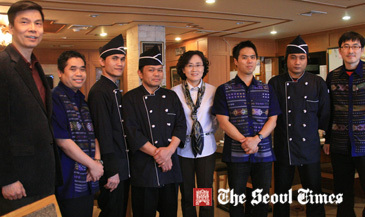 In a recent interview Mr. Park said that "Thai Garden" makes over 100 different authentic Thai dishes. 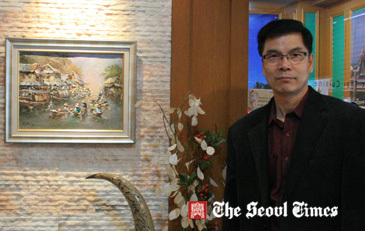 He believes that "Thai Garden" produces more authentic Thai food than any other Thai restaurants in South Korea. All of their four floor and four kitchen staff are Thai, brought directly from Thailand and trained personally by Mr. Park. They all speak Korean language as well as English. 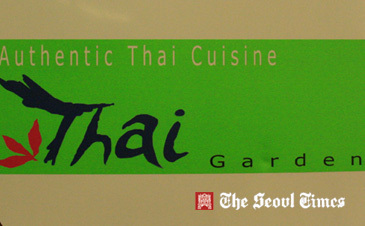 The middle-aged Korean businessman said that he was so infatuated by Thai food that he opened "Thai Garden" in 1996. He said that he wanted to bring the beautiful garden he saw in Thailand to Seoul. 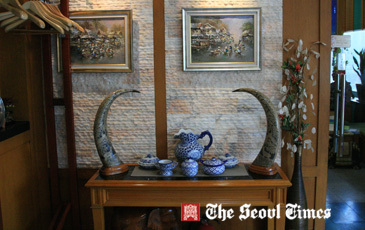 An elegantly carved elephant and water buffalo's horns made out of precious stone are parts of the impressive handicrafts inside the restaurant. Quite pricy paintings also decorate the walls of the restaurant. Mr. Park said he brought all the materials for the interior design from Thailand. 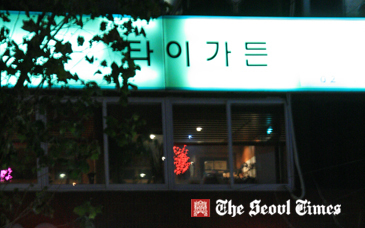 As the president of a trading company, Mr. Park wants to expand his restaurant business to other cities in the nation. 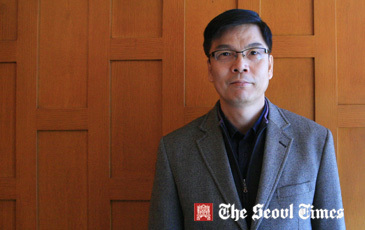 The following is the full text of his interview with The Seoul Times. Q1: First of all I would like to thank you for this interview. Why, do you think, your restaurant is popular? Is your restaurant different from others in what way? What are the characteristics of strong points of your restaurant? A1: Our restaurant is the fountainhead of Thai restaurant in Korea, and we haven't served a fusion style but authentic Thai food since we opened in 1996. Key for success of a restaurant is simple — such as better taste and service for our customers than those of competitors. Our competitive edge is that our restaurant is a good and authentic Thai restaurant not only in this nation but also worldwide. A lot of customers come from USA and Canada, Australia, Europe, Japan and South East Asia. They have already tried Thai food and they know very well what the authentic Thai dishes are. If they are disappointed with our food, they won't come any longer. We are always trying our best to make better taste than that of any other restaurants in the nation. Many of our Thai customers are from Thai Embassy in Seoul, Thai Tourism Authority in Korea, and other workers from Thailand. They keep saying that our food tastes even better than those in Thailand. We try our best to maintain our own taste through hard training for our cooking staff. Finally, we always listen to our customers, and we never argue with our customers no matter what mistakes they make. We always try to make our customers feel very comfortable at our restaurant. Q2: I believe that you have a large assortment of Thai foods. Could you tell me about your menu? What are some of the most popular dishes among the customers? A2: Though we have around 100 kinds of menu, we kindly explain and recommend suitable food from the perspective of our customers. 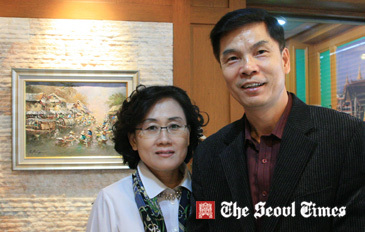 President Doo-Shick (Philip) Park and his wife Mrs. Jin Yang-Heo. The most popular food is the “Tom Yang Goong,” which is typical Thai spicy and sour soup made with prawns and many herbs such as lemon glass, galangal, kaffir lime leaves, and small Thai chilies. We always serve soups and foods fresh out of stove not already-made ones even if it takes longer time. Q3: How do you supply for your food material? Do you import any of your foodstuffs? Do you use Korean beef of Hanwoo or do you use imported beef? How many cooking staff you have? Are they local Koreans or Thai professionals? A3: We are using fresh local vegetables, some livestock and sea products as much as we can. But we have to use some herbs and spices, curries, coconut products, prawns imported to make authentic Thai food. Regarding meat we use beef from Australia and local pork and chicken. We are currently employing one chef who previously worked at a five star hotel in Thailand for more than 15 years. And our four other cooks worked professionally in Thailand for over 10 years. Q4: Tell me about your customers. How many of them are local Korean people? Are there many foreigners visiting your place? What kind of people are your main customers? Please tell me in detail about your guests, their age, nationality, and occupation? President Doo-Shick (Philip) Park (left) poses with his spouse Mrs. Park (5th from left) and with his staff. A4: Around 60 to 70 percent of our customers are local Koreans. Many foreigners are diplomatics, including ambassadors, businesspeople, soldiers, teachers of international school, students. Their age ranges from 20 to 60 years old. And they come from USA, Canada, Australia, Japan, Europe, and South East Asia. Q5: How many percentages of your customers returning to your restaurant after their first visit? How do you manage them? How do you maintain or expand your customers? A5: More than 50 percent of first visitors come again. We give the membership to our first visitors and monitor how often they come. This membership offers 4-5 percent pay-back which means that our membership holders are saving 4-5 percent from their payment. We are expanding our customers through advertisement on internet, magazines, and newspapers. We also host special events such as the "Gourmet Week," offering 50 percent discount and 10 percent discount for the some credit card holders. Q6: To me the interior design of your restaurant is very attractive. These days decorations are as important or even more important than foods, some people say. Could you explain to me about the concept of your interior design? A6: We wanted to make our restaurant to be in harmony with old and new Thai fashion, which can be as comfortable as any typical Thai houses. So we used a lot of timber, which gives us soft and intimate feeling and we also used some stones and bricks to make our restaurant look like a modern gallery. Q7: Please explain to me why you named your restaurant. Is there any reason? And on what occasion and when did you start your restaurant? A7: A real garden reminds us of freshness, comfort, lush greenness, variety color, So we wanted to make our customers those feelings of being in the real garden in Thailand. We opened our restaurant about 15 years ago in 1996. Q8: Do you have other businesses? Tell me all about your businesses. Also what are your future plans for expanding your business? A8: I have run a company in Thailand, a trading business, dealing with industrial items such as automatic voltage regulator, automatic rescue device for lift, etc. I have a plan to open four or five more Thai Garden branches in other Korean cities and in Korea and develop it into a chain business in the future. Q9: Could you explain to me about the personal side of yourself? How do you spend your free time? What are your hobbies? What are the important values in your life? A9: I don't have enough time to play golf even if it is one of the my favorite hobbies. So frequently I go mountain hiking in places not so far away from my house. I also like driving in the countryside. I enjoy nature like high mountains and sea areas. I believe that the most important thing in life is to keep me in sound health in order to maintain my business and to fulfill my responsibility and duty given from the God. I have kept working out since 1998, I exercise almost one hour every morning. President Doo-Shick (Philip) Park of "Thai Garden"
Q10: How about your family. Can you introduce your family members? What do they do for a living? A10: My wife is working together with me at our restaurant. She inspects food materials, kitchenware, and monitor the taste of foods. And my two sons are in USA. The older one is working at the M & A (merger & acquisition) related team of the Citi Group HQ in Manhattan and my younger one is studying at NYU in New York City.